With great team spirit and an almost superhuman effort, Porsche won the 2017 Le Mans 24-hour race. 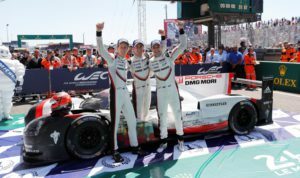 Earl Bamber, Timo Bernhard and Brendon Hartley caught up brilliantly and secured the 19th overall win for Porsche on June 18. A comparable effort dates back exactly 40 years ago, when Jacky Ickx, Jürgen Barth and Hurley Haywood came back in their Porsche 936 from position 42 to win the race. The 85th running of the world’s biggest and toughest car race started with a one-two lead for Toyota and an unfortunate setback for the car number 2 Porsche 919 Hybrid, the car that ultimately won the race. At 6:30 pm, the 919 of Bamber, Bernhard and Hartley was forced to make an unscheduled pit stop. It took one hour and five minutes to change the electric engine that drives the front axle. The car re-joined the race at 7:35 pm placed 56th, 13 laps down on the race leader. During the night, the strong competition from Japan had to accept losses. The number 8 Toyota pitted for lengthy repairs while the number 7 stopped on track because of a clutch failure and number 9 did the same after an accident in traffic. At 00:45 am, the car number 1 Porsche 919 Hybrid took the lead. Porsche again paid the price of a race staged in high ambient temperatures at 11:09 am: engine failure on the leading car. After a strong performance in P1, lasting for more than ten hours, the dreams of Neel Jani, André Lotterer and Nick Tandy came to a sudden end. Now the time for the hunters had arrived. The number 2 Porsche 919 Hybrid was the best placed LMP1 in the race and sliced through the LMP2 field. At 12:50 pm on lap 330, Bernhard was back on the same lap as the race leader. By lap 347, he had closed him down to take the chequered flag 20 laps later as the overall winner. The winning team of car number 2 completed 367 laps (5,001.23 kilometres) at an average speed of 208.2 km/h. Car number 2 headed the race’s overall classification for the final 20 laps. The most led laps of the race were completed by the number 1 sister Porsche of Neel Jani, André Lotterer and Nick Tandy. It led the field from lap 155 until and including lap 318 (00:45 am until 11:09 am). Additionally, it led two more laps from earlier in the race due to pit stop periods. In total, the number 1 car led for 166 laps. At the time of the car number 1’s engine failure, it led by a 13 lap margin over the rest of the field. 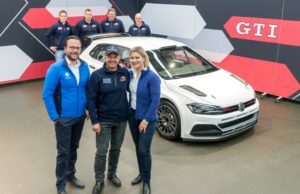 During the 24 hours, the race saw three safety car periods (15 laps) and 27 ‘slow zones’ during which the drivers had to reduce speed to 80 km/h. For only 246 laps of the 367 laps race distance, the 13.629-kilometre long track was entirely green. The winning car entered the pit lane a total of 29 times, once for a drive-through penalty. Including the long stop for repairs, it spent one hour 38 minutes and 5.211 seconds in the pits. The race winners used ten sets of slick tyres and the car was refuelled 28 times. The highest top speed of the winning Porsche 919 Hybrid in the race was officially measured at 334.9 km/h (Bernhard on lap 338). The longest distance covered with one set of tyres was 43 laps – lap 124 until lap 167 – with Earl Bamber at the wheel. Only one lap shorter than this was Bernhard’s final run from lap 325 until the finish after lap 367. Bernhard clearly drove the biggest share of the distance. He did 159 laps in total, Hartley was in the car for 106 laps and Bamber for 102. Before the race, Bernhard’s weight – including overalls and helmet – was 65.0 kilogrammes. After the race, he tipped the scales at 63.8 kilogrammes. 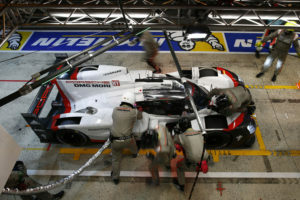 The fastest full-service pit stop, including a tyre and driver change, by the Porsche Team, was 82.343 seconds. The fastest stop for refuelling (full tank) was done in 64.342 seconds at 10:14 pm. The drivers had 0.9 litres of drink on board for each stint. The drink bottle was changed at every refuelling stop. 11 tear-offs in total were removed from the winning car’s windscreen for the best possible visibility. The highest ambient temperature was 31.5 degrees Celsius shortly before the finish. During the night, the air cooled down to 19 degrees Celsius. The track temperature reached its peak on Saturday at 39 degrees Celsius. The lowest track temperature in the night was 27 degrees Celsius. 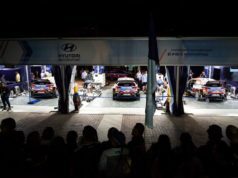 25.2 gigabytes of data from car number 2 was transmitted to the pits during the 24 hours. After three out of nine rounds of the FIA World Endurance Championship, with double points in Le Mans, Porsche now leads the manufacturers’ standings with 111 points ahead of Toyota (74.5 points). In the drivers’ world championship, Bamber/Bernhard/Hartley have scored 83 points and are leading by a 21 point margin. Jani/Lotterer/Tandy are currently in 5th position with 28 points. 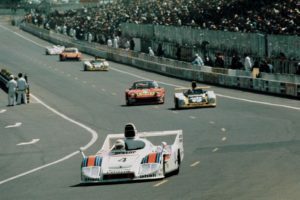 Also 40 years ago, Porsche managed what seemed impossible at Le Mans. This is how the six times overall winner Jacky Ickx (now already 72-year-old) remembers it.